Skincare brand Aesop's new Hamburg store by Belgian studio Vincent Van Duysen Architects features ladder-like shelving made from oak and blackened steel, and a large stone sink (+ slideshow). Aesop Hamburg is located in a glass-fronted ground-floor unit of a nineteenth century building in the German city's ABC-Viertel quarter. 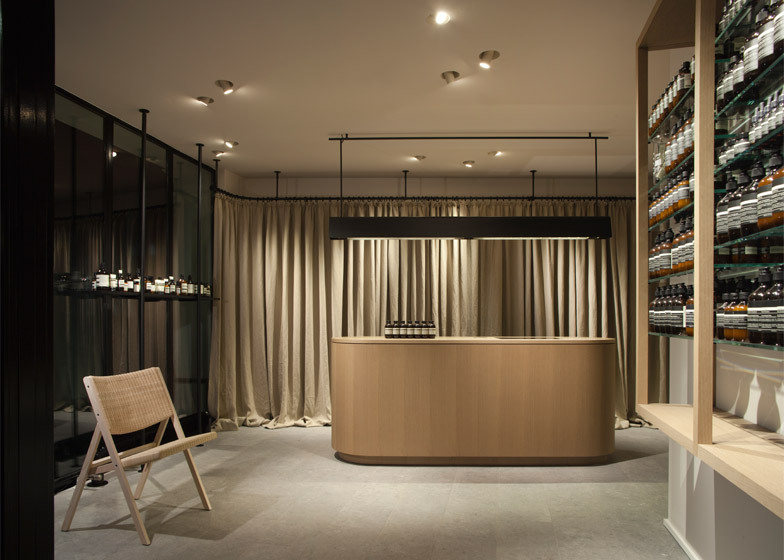 The 112-square-metre space contains a retail area at the front and a facial treatment room – Aesop's first in Europe – at the rear. A pared-back theme and natural materials were chosen to match "the building's location in a listed and protected building in the heart of one of the city's most vibrant streets," Vincent Van Duysen Architects told Dezeen. The walls have been stripped back to their original state and covered in pale textured plaster while the floor is tiled with bluestone. Shelving made from untreated oak lines the walls of the space visible from the street. On one wall, Aesop products sit on a boxy unit with glass shelves while on others, they sit on wooden shelves that are fixed between floor-to-ceiling poles like the slats on a ladder. In the window, a blackened steel shelf on metal rods displays more skincare products and references the store's original cast-iron facade, according to the architects. A sink made from large square pieces of bluestone stands on one side of the shop. A circular shelf and industrial-style taps rise from its centre. Long rectangular pendant lights – designed in collaboration with specialist firm PSLAB who worked on all the lighting for the store – are suspended above two curved oak counters on the other side of the retail space. One of these is used as the sales counter and the other for display. The wall behind the counters is covered by a floor-to-ceiling linen curtain. A small waiting room with wooden flooring leads from the main space to the treatment room at the back or the store. The room contains wicker chairs and a wall lamp with circular shades on the end of black metal rods. In the facial treatment room a therapy bed is completely surrounded by a full-length linen curtain. In the corner of the room stands a green curved sink and cupboard unit. Black metal spotlights are arranged in a grid on the ceiling to provide directional lighting throughout the space. 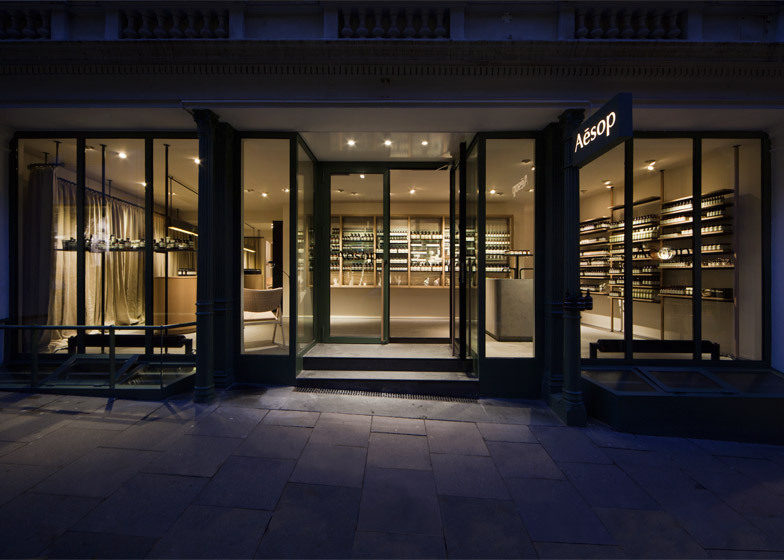 PSLAB have worked with a wide range of designers on lighting for many other Aesop stores, including the timber-lined Melbourne branch. 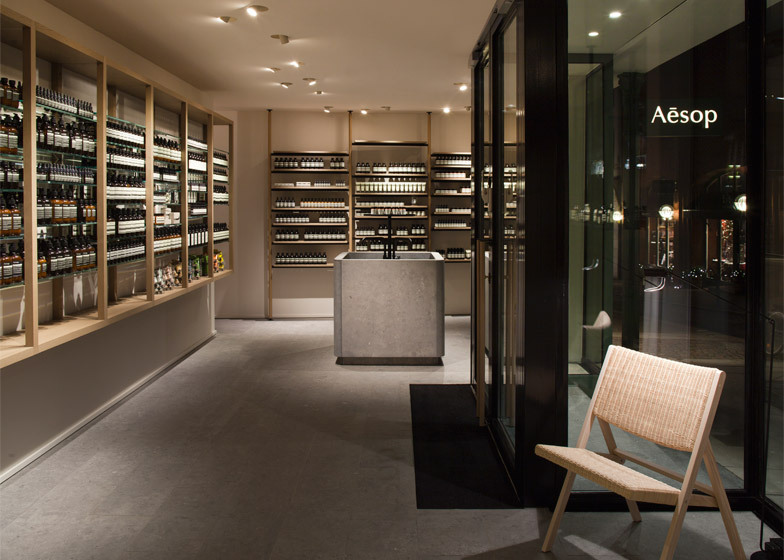 Other Aesop shops in Germany include the brand's Berlin store which is covered in emerald-coloured tiles.